I made a couple of unofficial & unsupported boot images of Webconverger with Opera instead of Iceweasel. 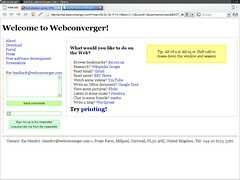 Download the Opera browser with Webconverger here. It's configured for kiosk mode and it should have the very latest Opera browser installed. Try it out and let me know what you think.